Early in Music For Listening To Music To, Katy Goodman’s stunning soprano ascends about 40 seconds into “One True Love,” resulting in a gorgeous moment of sonic bliss to inspire a half-dozen heart-eye emojis. Moments like these are par for the course on a La Sera record, but what makes this one so striking is that it follows a verse by Todd Wisenbaker, her collaborator and, as of late last year, spouse. While Wisenbaker’s vocals have their own kind of dusty swagger, they lack the personality to thrive alongside Goodman’s here or on the other two songs he leads on. 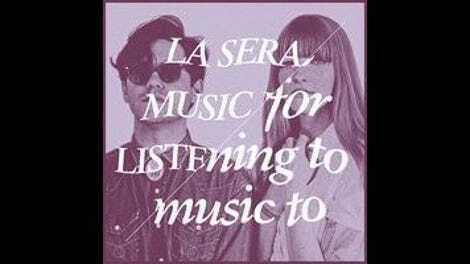 With Music For Listening To Music To, Goodman has recast La Sera as a duo, which unfortunately strips away some of the project’s shine. Until now, La Sera always felt like a vehicle for Goodman, herself a veteran of the defunct fuzz-pop trio Vivian Girls. Across the three records that preceded this one, she cleverly fine-tuned her inspired melding of ’60s girl-group melodies, grunge guitars, and confident, evocative lyricism, with the results feeling like a natural evolution of her work with Vivian Girls. Even at their loudest and most brash, the singer’s lush, layered vocals created a sense of intimacy, like a chat with an old friend. Bringing Wisenbaker into the fold feels like watching that friend walk into the bar with somebody you’ve never met; the rapport just won’t be the same. It’s an admirable project and a fine experiment, but it changes the dynamic of Goodman’s work in much the same way that 2010’s collaborative Jenny And Johnny LP did for Jenny Lewis. Not that this is necessarily a bad thing, of course; artists evolve and collaborations inevitably inform the direction of their work. It’s also not completely out of left field. The DNA of this album’s effervescence can be found on 2014’s Hour Of The Dawn, on which Goodman began her collaboration with Wisenbaker, but Music For Listening To Music To is a sunnier listen than that record, both cleaner and more romantic. Reverb still abounds, but the songs here swoon where they used to slam. “A Thousand Ways,” for example, is a starry-eyed ode to true love’s possibilities. In the world of La Sera, the concept of true love is both real and attainable, and Goodman’s gauzy lyrics leave no room for cynicism or irony. That romanticism extends to “Take My Heart,” a spare, shimmering ballad that could easily soundtrack a slow dance at a ’70s prom. But while the record is undoubtedly pretty, it also feels defanged. Goodman’s presence isn’t as richly felt, what with Wisenbaker’s sub-par vocal contributions and the tightly wound production of Ryan Adams. Adams told Rolling Stone last October that he wanted to help Goodman “lose control,” and while this record certainly highlights her range, it’s also diminished the sting and danger that always lurked under her angelic voice. “I get the vibe a lot from people that they know what La Sera sounds like,” Goodman told Rolling Stone. “This record will be like, ‘No, it sounds different than you think it sounds.’” She’s not wrong, but it also sounds like she’s still figuring out what La Sera sounds like, especially now that it’s a duo. Still, no matter where La Sera goes, whether it’s back to the fuzz-pop of yore or deeper into the dusty annals of alt-country, Goodman’s voice is one to follow.